April 15-19 saw the Kentucky Expo Center (KEC) in Louisville, KY as the host to the largest wheelchair basketball competition in the sports illustrious history. The National Wheelchair Basketball Association (NWBA) was represented by nearly 70 teams across 5 different divisions in what was some of the most fantastic athletic competition around. Some twelve courts were laid down in the expo center with wheelchair hoops going on for nearly 4 days in what seemed like around the clock action. Vendors, fans, and athletes alike all showed up full of energy for what turned out to be a fantastic event. The ‘Per4max Medical Shootout’ and the ‘Invacare TopEnd Junior Instructional Clinic’ were two of the unique functions that were allowed to go on due to the massive concentration of athletes at this years event. Paul Schulte and Kris Kommer led each of their activities and helped moved the envelope forward with our young athletes, with Per4max donating a chair to Abraham Weisman for winning the ‘shootout’. In the Championship Division (CD), the highest level of competition on the menu for this tournament, the Dallas Mavericks led by Tournament MVP Jason Nelms brought home the championship in what was a rematch of last year’s final with the New York Knicks, led by Pat Anderson. The final was controlled by Dallas by six to ten points for the majority of the way until it was for but a brief moment brought to two points with roughly six minutes remaining. The Mavericks proved to be too strong and quickly moved away by securing some clutch free throws. Plus, making life miserable for Patrick Anderson as he attempted to get down the floor. In the Division III bracket it was the Miami Heat that found championship glory over the San Antonio Spurs in a closely contested 70-66 victory. In the Junior division it was the TIRR Hot Wheels of Houston that laid down a dominant performance over the Minnesota Timberwolves, claiming victory by 30 points. The most outstanding part of this tournament is that the future of wheelchair sports seems to continue to grow every year. More and more competitive opportunities are being offered to kids and youth with disabilities. The opportunity at this tournament is the fulfillment of many dreams and aspirations by teams, kids, adults, and their families, which allow competitive sport for all ages and numerous ability levels. During this time in our country where 5.5 million children with disabilities participate in activities at a 48% level, there is still a need for more programing and competitive experiences for kids and youth. Hopefully, what was achieved at this tournament can continue to grow and spread it’s energy to reach every area of our country to provide opportunities for all people with disabilities. All in all I can say I was honored to be a part of the event, with my own team coming in 14th in the Championship Division; it is truly beautiful what basketball has done for my life and for the lives of so many others. 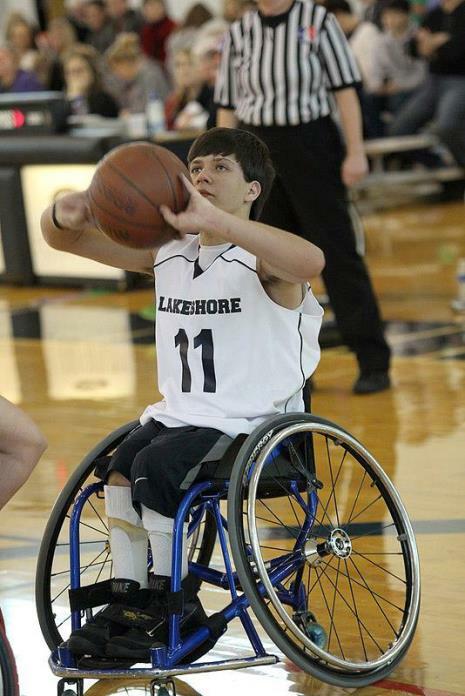 Jeremy Campbell competed at the University of Wisconsin-Whitewater, Orlando Magic, professionally for the Taranto Dream Team and is now a Recreation Specialist at the Lakeshore Foundation. He has also revived his career with the Lakeshore Storm of the Championship Division. This event is just the cherry on top for wheelchair sports for this past month in the city of Louisville. They also held the US Quad Rugby Association (USQRA) National Championship. Outstanding commitment Louisville to wheelchair sports. It would be great if other cities and states could make that same commitment. Big Thanks to Jill Farmer who organized it all.